Southpointe Telecom handles infrastructure cabling in pre-construction and upgrades to already existing buildings. 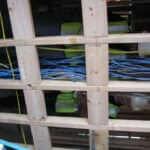 Running cable for television, internet, phone lines, CCTV, and fire and alarm systems. Low voltage had simple solutions in the past. 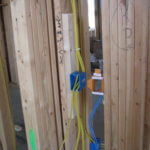 Planning for infrastructure cabling a few years ago was very simple. The local cable TV company was called to install coaxial cable runs to each apartment for TV programs. The local telephone company was called and a pair of wires was run to each apartment for dial tone. Each company ran their own cables. Usually there were no charges for this material and labor. The dilemma: Then came Internet with its many technical issues. Added to the dilemma was deregulation of utility services. The two monopoly’s (cable TV and telephone company) were broken up so that new companies and technology could compete fairly. More than five local and national companies now offer TV, Internet, Telephone and alarm security. Added to this list are marketing companies (or resellers) of the same services. The Technical changes: What was once a simple telephone company, cable company issue has evolved into a multifaceted array of competitive services. For example: Comcast who once provided only cable TV now offers internet and telephone dial tone. ATT/Bell South is offering dial tone, internet and FIOS, with TV programs. Direct TV satellite is now offering TV programming, telephone and internet using rooftop dishes. The local internet companies now can offer high speed internet, telephone using Voice over internet, satellite radio and Cable TV programs. What else has changed? Next step - all vendors will be offering CCTV cameras and security alarm services. (You can view your home or office remotely from any laptop, Iphone or Android devices. Cellular technology is now offering high speed internet, GPS tracking, E-mail and Television programs with a threat to replace all cable infrastructure. Wireless will be the next wave but it can have shortcomings. The Challenge: Were does this leave the developer and general contractor? For starters, service providers will be in conflict with each other. Each service provider will present his biased idea and fight for position to gain technical and marketing advantage over the other. We are here with ideas to simplify your systems. How does it work? We have 60 year olds technicians with traditional technology and 30 year old technicians with new leading edge ideas. All blended together to give you a cost effective solution. Were does all this leave the developer? Solution: More than ever it has become important for the developer to work exclusively with a low voltage engineering company that can help control all the technical aspects. There are cable type, layout, access, security and technology selection. The engineering company must be able to work with all service providers so that building office staff and apartment tenants can make any combination of choices for TV, Internet, telephone and security. This requires engineering so that all service vendors have equal access. This is a taunting task and requires selection of a low voltage company that has engineering talent and experience in all fields, fire detection, telephone, internet, CCTV, burglar alarms, TV programming and card access. Developers must team up with a company that is hard working and can be trusted to come up with the right answers. 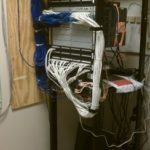 There is no absolute right or wrong way to install cabling. Most of the time these answers are a compromise between time, quality and price. Time element: In the past, tenants did not occupy the property until all phases and apartments were completed. Now with close competition, and cost of money, developers are opening apartments during construction. The challenge now becomes a balancing act between construction and leasing sales/management. 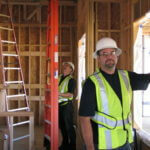 Construction deadlines are a challenge to meet because new tenant leasing is in the way. Leasing office quotas are a challenge to meet because construction is in the way. Investors want to see quick turn around and faster positive cash flow. Since the construction team was there in the planning stage, the burden of problem solving seems to fall heaviest on them. 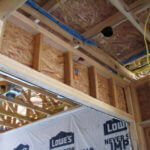 It’s easy for all of us to set on the sidelines and criticize the construction team. What are the variables of the game? For starters, weather, material price changes, building code changes, market demand changes, property theft, safety concerns, changing handicap codes, changes in management staff , foreign labor with language barriers. This list goes on. New tools: For the first time new technology has come to the front stage on building, sales and leasing. Computers can quickly monitor price changes, Building codes can be downloaded from web sites, Property can be viewed remotely and protected with CCTV cameras using record playback. Hand held language translators can be issued. Internet email can replace paper memos. Cellular direct connect intercom and texting can allow group broadcasting of announcements. Texting cellular and use of Blackberry/Iphone technology can speed up responses. As you can see, more emphases is being shifted to technology as a key management tool. Solution: The best solution is to pick a technology partner that has experience and insight into new products and services. The technology partner must have integrity in order to be able to sort through the issues and come up with solid solutions that are accurately conveyed to the construction team. The technology teams will constantly be challenged by TV, Cable, Telephone, Fire and security vendors for control. 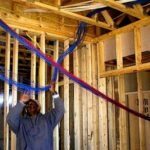 It is important that developers standby their low voltage engineers and not waiver with each utility vendors demand(s).